Roamer’s page today continues its pre-Christmas perusal of some stories and accounts shared here during the past 12 months. On Wednesday, Belfast’s docker-poet John Campbell recalled Sailortown, and we revisited Rathlin Island’s historic gales of 1938. We also remembered the heady days of Samuel Davidson’s internationally-renowned Sirocco works with its world-wide distribution of massive ventilation units built in Belfast. Along with ships, aircraft, heavy machinery, ropes, cotton, tobacco and linen, the city’s vast and varied tally of exports was unmatched by any other industrial metropolis on the globe. This was a recurring theme throughout the year – a remarkable, local distinctiveness, drive and originality, where coming first, or being first, or doing something unique, was more than evident in many of the accounts shared here. 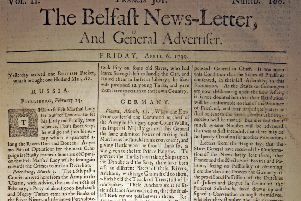 Today’s page begins with two fine examples of those qualities, in Enniskillen and Whitehead. Regular contributor Selwyn Johnston told an intriguing tale back in March about Enniskillen being the first town in the whole of the UK and Ireland, and probably much further afield, to celebrate the First World War’s Armistice. The historic accolade came after a wireless operator in the town’s military barracks picked up a faint, early-morning Morse code signal originating, it turned out, from Paris’s Eiffel Tower! Prime Minister Lloyd George made his official announcement at 10.30 on November 11, 1918, that the Armistice had been signed by General Foch in France at 5 am that morning. So by the time the Prime Minister spoke to the nation on the wireless, most Fermanagh-folk were already exhausted from cheering, singing, celebrating, dancing in the street and playing music. In very different circumstances a century later, but similarly distinctive and celebratory, came Whitehead’s ‘Oscar of Steam’, awarded earlier this year by the Heritage Railway Association (HRA) to Whitehead’s Railway Museum. Roamer applauded loudly along with hundreds of top-notch railway enthusiasts and experts in Birmingham’s glitzy Burlington Hotel as Peter Scott, Canon John McKegney and Robin Morton from the Railway Preservation Society of Ireland’s (RPSI) accepted the hugely-coveted Manisty Award for Excellence from railway guru Lord Berkeley OBE. There are around 30 annual awards for railway heritage organisations of all kinds across the UK and Ireland but the Manisty Award maintains such extraordinarily high standards that it’s often not awarded. But Whitehead brought it home! Incidentally, at the same ceremony Enniskillen’s Headhunters Railway Museum was awarded runner-up in the Outstanding Achievement category. Both railway organisations depend on teams of enthusiastic volunteers for their success, and at the end of March this page was adorned with pictures of Irish dancers, musicians, actors and singers – just a few of the 300,000 volunteers who work in over 17,000 voluntary organisations across Northern Ireland. Over 100 Queen’s Awards for Voluntary Service (QAVS) have been presented here since 2002 and in March Roamer was privileged to attend ‘Voices of Volunteers’ in Newtownabbey’s Theatre at the Mill, celebrating 15 years of QAVS. The award is the highest honour for volunteer groups in the UK, and a small selection of previous winners described their work to the BBC’s Helen Mark in front of a packed auditorium in the theatre. The Citizens Advice Bureau, the Agewell Partnership which works with people aged 60 years and over and the Northern Ireland Hospice, were represented along with a village committee, a horticultural society, a football club and a community development organisation. The diversity of volunteers’ voices was almost overwhelming – from the Active Group, a social group for young adults who have mild/moderate learning disability in the Newry and Mourne area, to the North Armagh Motor Cycle and Car Club…the Tarmac Section! It was undoubtedly a night to remember. And much else was remembered on Roamer’s page during 2018, sometimes strange, sometimes startling, but always special. There was Ballycastle’s runaway train 75 years ago on January 9, 1943 – soon it’ll be 76 years ago! Engine number 41, hauling two passenger carriages, ten ten-ton freight wagons and a brake van from Ballymoney to Ballycastle, went a little further than it intended – through the buffer stop, across the roadway, through two fences and into a stream. Engine driver James McKissick suffered only minor injuries. And remarkably, on one else was hurt. Banbridge author and story-teller Doreen McBride revealed that Andrew Barton ‘Banjo’ Patterson, writer of the iconic song Waltzing Matilda, was the great great grandson of General Barton from Pettigo. And finally, on a wintry note – amongst the many wartime accounts shared here during the year, back in May we were told about the many sorts, shapes and sizes of cenotaphs across Northern Ireland. One was a ‘Snowman Memorial’ erected in Newtownards in 1924! There’ll be more memorable extracts from the past twelve months between now and the New Year. Meanwhile have a very happy Christmas and thank you for sharing your stories and accounts on Roamer’s page during 2018.